It’s long overdue, but I’ve finally come to the realization that life isn’t going to be slowing down anytime soon. I’m always going be preparing for some trip/work project/house guest/dinner party or recuperating from some trip/work project/house guest/dinner party. So in between this weekend’s holiday baking, chaotic dinner with friends, and massive pantry clean out, there were these spicy Thai noodles. In all of their imperfect, barely-styled glory. But one bite of the porky, carb goodness and I think you’ll be willing to forgive me for their somewhat homely appearance. 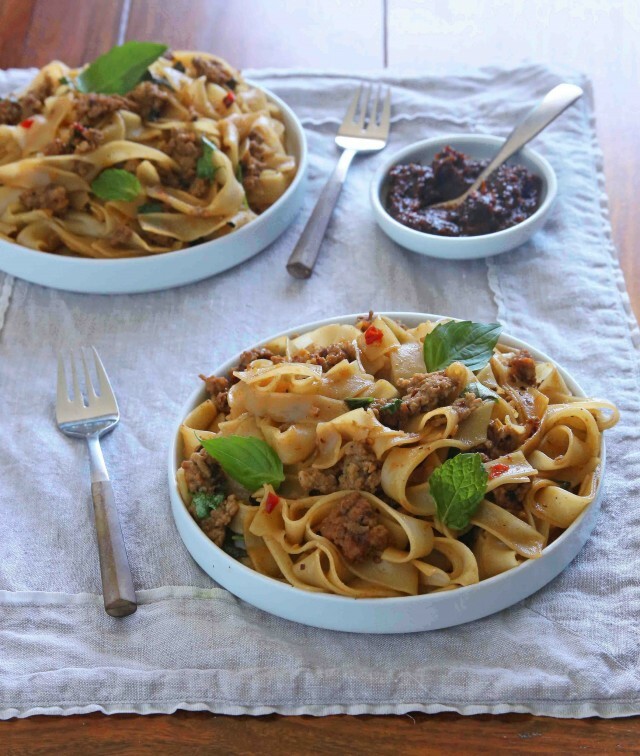 Wide, flat rice noodles are combined with ground pork and a spicy sauce made from my new favorite condiment, Thai chile jam (I made a quadruple batch of this stuff over the weekend!). 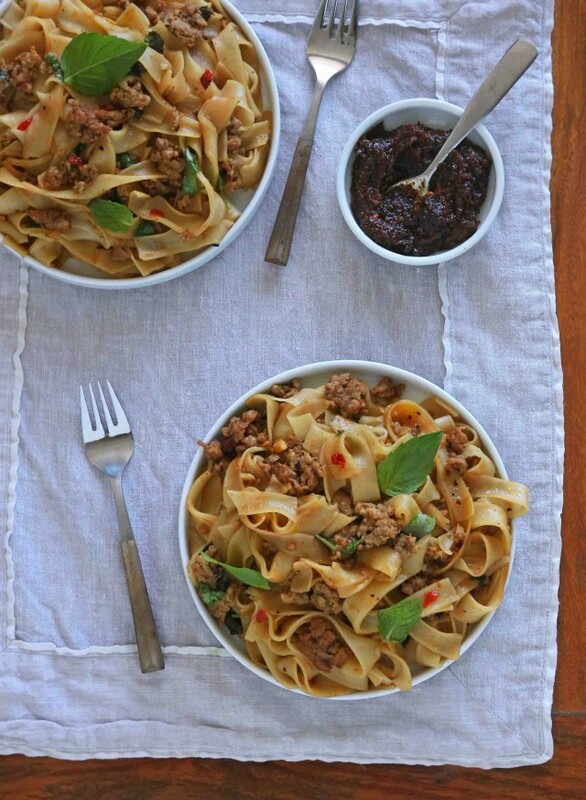 Consider this stuff a Thai version of Pasta Bolognese. Quick-to-make, but stick-to-your-ribs and comforting at the same time. This time I made it with pork, but I’ll be happily experimenting with ground chicken and turkey in the not-too-distant future. 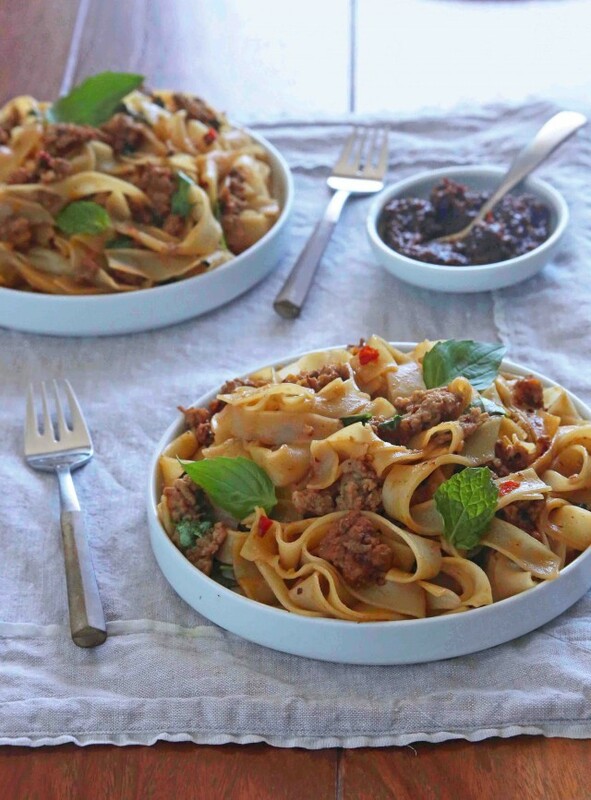 Soak the noodles in lukewarm water for 30 minutes and then drain. Bring the 4 cups of water to a boil in a large saucepan, add the noodles and cook the noodles for about 2 minutes, until just cooked through. Drain and rinse with cold water. Drain and set aside. Add a slight drizzle of oil and work through the noodles to help prevent them from clumping. In a large skillet or wok, heat the oil over medium-high heat. Add the garlic and chile and cook, stirring frequently, until softened. Add the Thai chile jam and cook for about a minute, stirring constantly. Add the pork and cook, using a wooden spoon to help break up any large chunks of meat, until the meat is nearly cooked through. Add the broth, palm sugar, fish sauce, and white pepper and bring the mixture to a boil. Add the cooked noodles and, stirring constantly, continue to cook until the noodles have absorbed most of the liquid. Remove from heat, stir in the cilantro, mint and Thai basil and serve.